One of the goals of our site is to continually keep you up to date on the best places to get all things Clemson. Today we would like to introduce you to another fabulous online boutique that sells items tailored to a Clemson Girl’s needs. Totally Collegiate was created for ladies of all ages who are fashion forward and passionate about team spirit. They are focused on providing the best selection of fashionable game day and everyday wear for Clemson alumnae, students and fans. Totally Collegiate sells fashionable women’s clothing (including the popular Chevron gameday dresses! ), jewelry, handbags, stadium stompers and more. You can shop Totally Collegiate’s amazing Clemson products exclusively online at www.totallycollegiate.com. While Totally Collegiate has a large selection of Clemson products, we want to share two of our favorites with you. Every Clemson Girl needs a “carry everything and anything” tailgate tote. 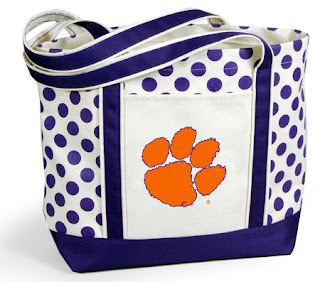 This polka dot Clemson paw tote is adorable - perfect for carrying anything and everything to your tailgate. 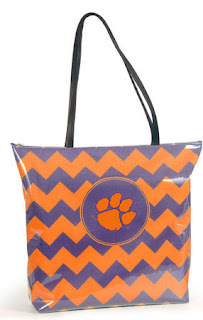 It would also make a great baby bag for you Clemson mommies. And it’s no secret that we love, love, love chevron – so of course we love this chevron Clemson tote! I would use this as my gameday purse because it would hold everything I need! Totes like this also make great gifts and could even be used creatively as the gift bag itself. Totally Collegiate has generously offered all Clemson Girls 15% off of your total purchase when you use coupon code clemsongirl15! Start your shopping now! Make sure you follow Totally Collegiate on all of their social channels so you can be one of the first to find out when new Clemson products are in stock… They are also interested in stocking up on even more Clemson products, so make sure you let them know which Clemson products you would like to see them sell in the future. We are lovin’ Totally Collegiate! Go Tigers! Just found out that the coupon code for 15% off may have been not working for everyone! Very sorry for the glitch and the issue has been fixed. If you experience any issues or have questions please contact us.